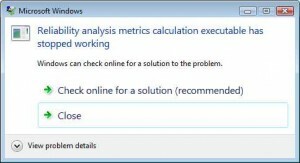 I have been using Windows Vista for a few years now but today I had a strange pop-up telling me that “Reliability analysis metrics calculation executable has stopped working” and asking if I would like Windows to check online for a solution or to close it. I chose to close it. Maybe not a good idea, who knows? Well, what is it then? There was no follow up on the problem. So I am still none the wiser. System Restore was suggested as a fix. Strange, I have not installed any new software for a while so no idea what could cause this rare problem. I will see how it goes for a while, maybe a reboot will sort it out. Ah ha, found an answer on Microsoft.com. Basically, a clean boot involves rebooting the PC with all start-up programs disabled and then disabling all non-Microsoft services. If the problem has gone on the boot, you then enable half the service and try again, and start to eliminate the healthy services and hopefully track down the problem. At do not have time to do this right now. Will have to wait! Will probably do a new data backup before fiddling about with this! ← Attitude: Login failed for SQL Server login ‘trojan’. The password for this login has expired.